The vast majority of Americans believe that drug prices are unreasonably high, and point to pharmaceuticals firms’ outsized profits as the reason, according to the Kaiser Family Foundation’s Health Tracking Poll. The poll also found that one in five Americans on prescription medications say that they find it difficult to pay for their drugs, and that nearly three quarters of Americans know little or nothing about a pending Supreme Court ruling on Obamacare. 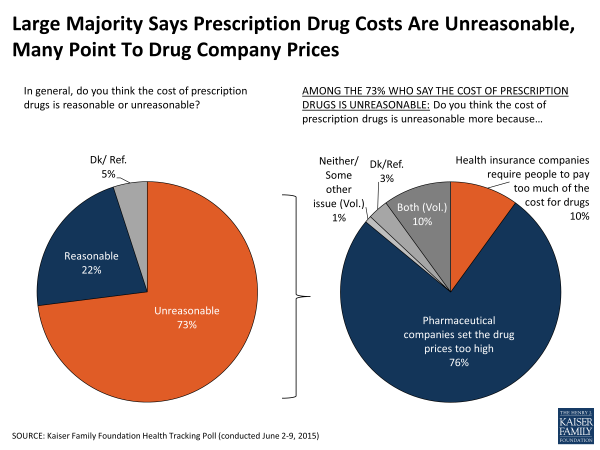 The pollsters asked, “In general, do you think the cost of prescription drugs is reasonable or unreasonable?” In response, 73 percent of Americans said that they believe drug prices are unreasonable, and among them, 76 percent said that the primary reason is drug companies seeking excessive profits. Another 10 percent said the prices are unreasonable because insurance companies require people to pay too great a share of the cost of the medications. Among the 50 percent of respondents who said that they were taking prescription medicines, 76 percent reported that it was easy or somewhat easy for them to pay for them. However, 21 percent said that it is either difficult or very difficult to pay for their medications, and 25 percent said that they have at some point either skipped necessary medication to save on the cost or have reduced their dosage, for example by cutting pills in half, to make their drug supply last longer. The poll also asked respondents about the King v. Burwell case that the U.S. Supreme Court is expected to rule on later this month. The case, which challenges the legality of federal health insurance subsidies paid to people living in states that rely on the federal insurance exchange, could represent a major blow to the Affordable Care Act if the court sides with the plaintiffs. Despite the fact that more than 6 million people would likely lose their health insurance, and an untold number would suffer adverse consequences due to follow-on effects in the insurance market, the majority of Americans know little or nothing about the case. 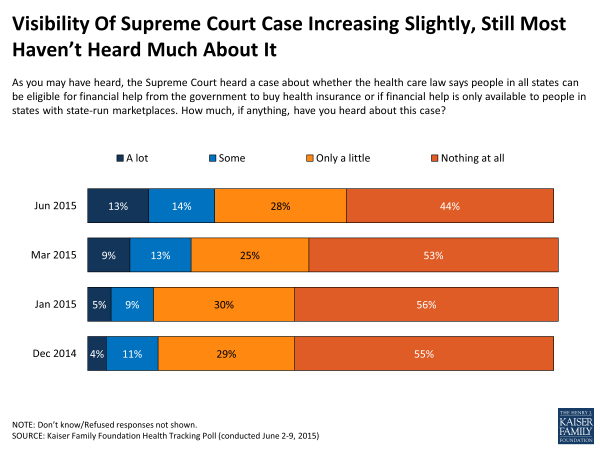 Of the respondents, 44 percent said they know “nothing at all” about King v. Burwell, and another 28 percent said they know “only a little” about the case.